Buying or selling a property is rarely a stress-free process. However, when the house or flat being sold forms part of a divorce settlement, that stress can multiply. So, if you’re in the position of having to sell the home you once shared with your husband or wife, I hope the following information helps to make what you’re about to do a little easier. Whilst this article has been written predominantly with the traditional high street or local estate agency in mind, there’s no denying that the online firms are an emerging force within the industry. Providing a balanced view of the plus and minus points of the two types of estate agency, especially when selling a former marital home, would require a separate article. For now though, here are a few brief points to consider. Today, most house hunters commence their property search on the internet. Online estate agencies, like traditional agents, advertise their clients’ homes on major websites like Rightmove and Zoopla, to name just two. The fixed fees of internet based agencies offer property sellers considerable savings against the percentage rates charged by their high street counterparts. The latter, however, tend to have a more in-depth knowledge of their local market. The packages offered by some online firms may involve the seller in undertaking some of the tasks required to sell their home. This may include anything from setting your own asking price to conducting the viewings and negotiating offers directly with your buyers. Understandably, some sellers will not want to be so directly involved in selling their home; especially when going through divorce. That being the case, their preference may be a high street estate agent. Other sellers will quite happily adopt a hands-on approach and for them, instructing an online estate agency can save thousands of pounds. Assuming you prefer to use an estate agency based on your local high street, which one do you choose? Do you simply invite several to value your home and instruct the one who recommends the highest asking price or quotes the lowest fee? A key indicator of a successful estate agency is their board presence. And by that I mean how many of their boards are displaying outside properties in their catchment? If most of those boards read “For Sale” they could be the result of the agent overpricing the properties they relate to. They could also be part of a special promotion offering cut price or zero commission on all new instructions for a limited period; a condition of which is agreeing to have the agent’s board outside your home. Incidentally, read the small print on such offers because if your property’s not sold by the end of the promotion, the discounted fee may revert to a level twice that of other agents. The boards you’re looking for are “Sold” boards because they mean the job’s been done. If an agent has recently sold a property in your neighbourhood, call them in to look at yours. Quite often they will have had more than one interested buyer for that property. If so, they’re likely to have a list of people who lost out on that one and are ready to buy yours – saving you weeks of viewings and the inconvenience that goes with them. A lot of the time, it is the individual who attends the appointment to value your home, and how they present themselves and their company, that will influence a seller’s decision to instruct. From my career and personal experience, given the option, I’d always choose an older estate agent to sell a property forming part of a divorce settlement. I do not wish to sound ageist and I’m in no way inferring that younger estate agents are not competent to handle sales of such a nature. What I will say is that I’ve only ever known a few who possessed the maturity and empathy required to sell the home of a person going through a stressful scenario such as divorce. Established estate agencies know this and generally won’t send along a 24 year old to value your home if it’s a divorce related sale. I’ve also seen younger estate agents, male and female, get manipulated by attractive divorcees whose homes they were selling. This could be anything from getting the agent to delay the marketing of the property, through to actions that demonstrate bias against the former spouse and co-owner of the property. Personally, the best estate agents that I ever worked with were middle-aged women. And when it came to selling my former marital home, it was a female estate agent in her fifties that finally got the job done. This was after she sorted out the mess caused by a younger team from the previous firm who failed to sell it twice in four months! Do you mention the divorce? “Don’t tell estate agents you’re divorcing as they’ll think you’re desperate to sell and undervalue your home to get it sold quickly!” was the advice one lawyer gave her client. This is not strictly true and I’ll tell you why. We all know about the housing crisis caused by the shortage of property – right? Well let’s forget the whole seller’s market thing for a moment as it doesn’t necessarily apply to every property in the country. Plus, what I say here should apply regardless of market conditions because when the sale of your home is part of a consent order, you may not be able to choose the economic climate you sell it in. Estate agents, in any shape or form; in good or bad markets, cannot operate without stock – your property. Even if you live in a remote area with only one estate agent for miles, you’ll still find any number of agents willing to market your home because the internet has changed the industry. And that’s without factoring in the online firms. It’s so competitive that if anything, estate agents are more likely to overprice your home as doing so has proved a reliable tactic for them to win your business over their rivals. If three out of four agents all recommend the same asking price but the fourth tells you he’s confident he’ll get you £30k more; on a no sale, no fee basis, who would you instruct? So in your initial contact with estate agents, you don’t have to tell them about the divorce but it shouldn’t matter if you do. Besides, even if you hide the tell-tale signs of a matrimonial split, once the sale gets underway and the property lawyers start their work, everyone involved will know the sale forms part of a divorce. There are exceptions, but they’re rare. There is something that you should definitely not let on about though. If the divorce has strained your finances – as it does for many of us – and you need to sell your home quickly, keep that to yourself! Such information falling upon the ears of the wrong person may lead to an unscrupulous individual attempting to exploit your situation for their gain, in more ways than one. And I’m not just referring to corrupt estate agents. I’ll explain what I mean in part two of this article. How many agents can you instruct? As many as you like is the answer to that question; however, instructing too many agents can give buyers the impression. If you give your property to five different estate agencies and they all list it on Rightmove, then your property is likely to come up five times consecutively on the website’s search results page. How do you think that will look – keen to sell, or desperate? If it’s known that the sale of your home forms part of a divorce settlement, the latter will be the general consensus among your prospective buyers. Let’s look at the plus and minus points of instructing one agent or several to sell your former marital home. Sole agency is when one estate agent is instructed exclusively in the sale of a property for an agreed term, usually eight to 12 weeks. During that term, the seller should not switch from or instruct additional agents – if they do, they could end up paying more than one commission. Even when a seller, signed up to a 10-week sole agency, terminates the contract half way through they may still be liable if another estate agent sells the property during what would’ve been the remaining five weeks of the original sole agency. With a multi-agency, there are no restrictions on how many agents a seller can instruct and no fixed term either. The agents market the property simultaneously and the seller pays only the one that introduces a buyer who contracts to purchase the property. The commission rate for sole agency is cheaper than multi-agency but if you instruct the wrong estate agent you will be stuck with them for the duration of the contract. Multi-agency doesn’t tie you to one agent and you can pit those you choose against one another. But while this may keep them on their toes, it may also keep them from being honest with you. Let’s say your sole agent introduces a buyer who offers the full asking price. Unfortunately, this buyer has an incomplete chain below them. Your agent advises you against accepting the offer until the chain comes together, which is sensible advice. Now, same scenario, only this time three estate agents are vying for the commission. The information provided to the seller may differ. The buyer may be presented as being in a stronger position than they really are, so the offer is accepted and the other agents back off, buying time for the less than truthful agent. If you’re going to go with a sole agency, don’t get tied in to a long agreement – six to eight weeks is ample time. If you’re happy with the agent, you can always renew an expired contract. If multi-agency is your preference, stick to a maximum of three estate agents. And where possible, instruct those based in different parts of your post code – that way you’ve got a wider area covered. 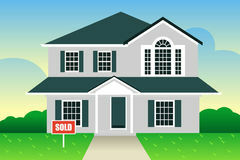 Please read part two for more tips on selling the former marital home.